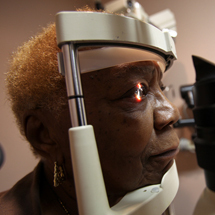 While people with diabetes are more likely to develop blinding eye diseases, recent studies have revealed low awareness of the issue among ethnicities at higher risk for diabetes and low uptake of preventive eye exams among affected Medicare beneficiaries. Although Hispanics and African-Americans are more likely to have diabetes than most other ethnicities, a recent poll commissioned by the Alliance for Eye and Vision Research has revealed that only 27 and 32 percent (respectively) report to know about diabetic eye disease. In addition, the American Academy of Ophthalmology recommends that people with diabetes have a dilated eye exam every year. A study recently published in the journal Ophthalmology found that, among Medicare beneficiaries diagnosed with age-related macular degeneration, glaucoma or diabetes – all conditions that require an annual eye exams – three-quarters of those who did not have an exam in five years were those living with diabetes. The term “diabetic eye disease” encompasses a number of diseases and conditions that can cause blindness if left untreated. These include diabetic retinopathy, cataracts, and glaucoma. Diabetic Retinopathy occurs when the small blood vessels in the eye change by swelling, leaking fluid or closing off completely, blocking blood flow from reaching the retina. A cataract occurs when the eye’s lens becomes cloudy, causing vision to become blurry, cloudy or dim. While this happens in many people as they age, those with diabetes are more likely to develop cataracts than their peers without diabetes. Glaucoma is a disease that damages the optic nerve and peripheral vision. The damage to the optic nerve is usually caused by elevated pressure in the eye. Glaucoma can be treated with medication such as prescription eye drops or with surgery, but will result in blindness if left untreated. The Academy recommends that those with those with type 2 diabetes should get a dilated eye exam at the time of diagnosis and every year following. Those with type 1 diabetes should start receiving annual eye exams five years after their initial diagnosis.